Avignon historical center 1 km, on the other bank of the Rhone, in the medieval village of Villeneuve, at the foot of Fort St André, charming restored village house, with stone and exposed beams, for 4 people, 2 bedrooms, 2 bathrooms, water, 2 toilets, kitchen living room, terrace + summer kitchen, air conditioning in all rooms. Ideal for the Avignon Festival, for a relaxing holiday, village Provencal atmosphere, near restaurants and shops, and country. On 3 levels: R de C: sitting area, sofa flat screen TV, full kitchen and side. Spiral staircase: 1st: 1 room for 2 p, 1 bed 180 or 2 beds 0. 90, private bathroom, small laundry, separate toilet. 2nd: 1 room for 2 p, 1 bed 180 or 2 beds of 0. 90, private bathroom, toilet. Staircase to access the terrace, beautiful views of the Papal Palace, the Fort Saint André and the village with summer kitchen (fridge + plancha + microwave) living and dining space. Cleaning € 65. Deposit 300 €. Village swimming pool 500 meters. 2 bathrooms + 2 toilets. The bathrooms are private to each of the two rooms, they are equipped with large marble walk-in shower, 2 sinks for each of the bathrooms. The bathrooms have direct access in every room. Towels are provided. Reversible climate control. Cot and high chairs with cot sheets provided Linen included in the price (sheets + towels + linen kitchen towels). Need ironing. Hair dryer. Washing machine. 2 microwave. Dishwasher. 3 fridge freezers (2 in 1 large kitchen + terrace). Terrace summer kitchen with sink, dishwasher, fridge / freezer, microwave, and plancha. Household demand during the stay (15 euros / hour direct contact with the person in charge of the household). Small pets allowed only on request for free. We spent a week in Villeneuve-les-Avignon in this beautiful Villa. It is a very spacious home with 2 large bedrooms and bathrooms, a large kitchen/dining room and living room. We enjoyed evenings on the rooftop patio, which has great views and is very enjoyable. Nicole warmly greeted us upon our arrival and both her and Michele were very nice, friendly and responsive to our communications before our arrival and very accommodating. The Villa was perfect for the 4 of us, and the furnishings and decor are all very nice. Though you can’t park at the Villa, there is free public parking within a short 5 min. walk from the house. The house is also a 10 min. drive from Avignon and also very close to several sites and restaurants. We walked to several great restaurants which were nearby, as well as a bank, small grocery store, pharmacy, town square, etc. The area is very safe, clean, beautiful and enjoyable. We would definitely stay here again if we visit Villanueve again in the future! The house is located in a perfect position, close to restaurants and shops but tucked away from any bustle. It is spread over 3 floors with a delightful roof terrace, with views over Villeneuve and Avignon. While we found the spiral stairs fine, it might be a problem if you were not so mobile. The house is very well equipped although we did not do much food preparation as there are too many great alternatives within a short walking distance. Nicole is a great host and was there to meet us and show us where everything was. Ample free parking is available close by, next to the Tourist Office. My only criticism is that the towels provided were a bit thin and we would have appreciated more than 2 each for the week. However, this is a small issue and we would recommend a stay at Cazarie to anyone wanting to visit Avignon and the Camargue region. In August we spent one week at this very lovely home. The village is beautiful and the location of the house is perfect. It is quiet, charming and fully equipped, and an excellent base for exploring Provence. It was very easy to slow down our lives and truly relax. We have fond memories of our week here. Traveling through France with friends, we booked a week long stay at this charming village townhouse. Can't say enough good things about the location and the accommodation. As it was VERY hot, the air conditioning in the unit was much appreciated. The kitchen was well stocked with all things needed to make your meals. The outdoor kitchen upstairs gave a stunning view of the surrounding area and was a beautiful spot for breakfast every day. Unfortunately, evening meals were not taken upstairs due to the very hot weather and humidity. The village is beautiful and many restaurants to choose from. A wonderful bakery within a few minutes walk provided us with croissants and baguettes every morning..... The owner, Nicole was very helpful pointing out the nearest grocery store. There is a cabinet on the main floor full of maps and information for the surrounding areas. It was a terrific place to stay while discovering all the amazing sites in Provence. I would highly recommend you stay here on your next trip! Thank you very much for this message at the very sympathic tenants, it was a great pleasure to welcome you at Cazarie house in Villeneuve lez Avignon. The house has everything need for the perfect holiday. The location is so convenient, not only in terms of its situation within the village but also its convenience to all those important sights within a 100km radius. The fascinating village square, with a wide choice of coffee shops and restaurants, was just around the corner. In the month we were there we became very friendly with many of the shop owners. It is also only a short stroll to the well stocked twice weekly markets. Parking was never a problem. As well as being free there was always plenty of it. The amenities provided within the house were first class, with a more than ample supply of utensils and linen. How about two refrigerators in the kitchen! The separate cooking facilities (including its own bbq, refrigerator, sink, cutlery and crockery) on the rooftop terrace was an added bonus. As for the decor throughout the house it is from "Vogue" magazine. Both bathrooms are so well appointed with plenty of room and having two basins in each is a great idea. There are also plenty of power points. Our hosts were always on hand should any additional requirements be needed. We particularly liked the idea of leaving a note in the letterbox and there was always a same day response. Visiting friends from the UK were also most impressed. The whole wonderful experience all added up to delivering one of the best holidays ever. Beautiful, peaceful apartment with superb rooftop views! 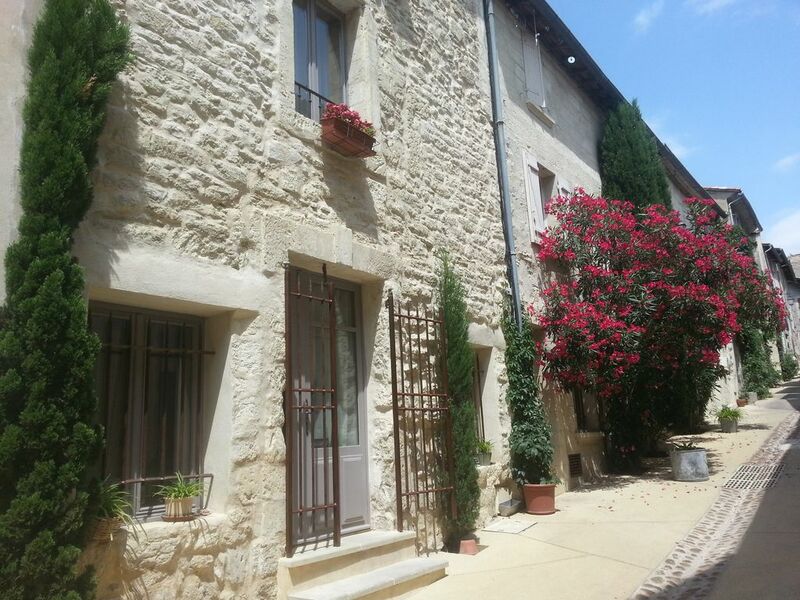 My husband and I spent a wonderful week at this beautiful apartment located in Villeneuve les Avignon. The little village was quiet and peaceful, yet we were only minutes from transportation to Avignon as well as Nimes, Arles, Chateauneuf du Pape and many other areas in the Provence area. There were plenty of options for meals including cooking in the spacious, fully equipped modern kitchen or dining out at one of the little restaurants in the village. We spent many evenings on the rooftop patio admiring the views of the Palace of the Popes and surrounding historic sites. Everything about the apartment was exceptional from its clean comfortable bed with linen sheets to the lovely tiled showers and window boxes full of flowers and herbs. Our host Nicole was most helpful and charming. We will return to the lovely home the next time we are in Provence. The house is in one of the most typical village street (pedestrian): prime location opposite Avignon (3 mins by car crossing the bridge), Villeneuve-lez-Avignon, on the other bank of the Rhone, city medieval, residence of the cardinals at the time of the Popes of Avignon, Villeneuve has a rich architectural and natural heritage: the Chartreuse one of Europe's largest, with the Fort Saint André Saint André Abbey and gardens amazing, the Tour Philippe le Bel arrived Villeneuve side or the famous Pont d'Avignon, the Collegiate Church and the famous Museum Pierre de Luxembourg. Provencal atmosphere, the village is surrounded by the countryside east side with the great plain of the Abbey. Ideal for hiking and cycling. The vineyards of Tavel nearby Chateauneuf du Papes. A few km from Pont du Gard, Saint Remy de Provence, Les Baux, Gordes, Arles, Nimes; the sea is 1 hour drive ... strategic place to visit this rich tourist region.